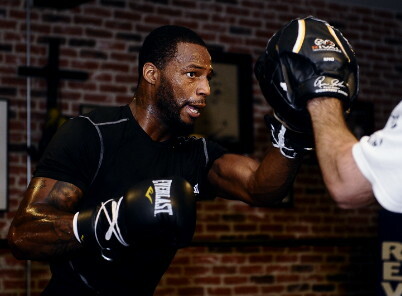 By Dan Ambrose: PHOTO CREDIT: Gene Blevins – Hoganphotos/Golden Boy Promotions – Former two time light heavyweight champion Chad Dawson is excited about being back with his trainer John Scully, who under his helm Dawson found a lot of success with a lot knockouts earlier in his career. Dawson recently let Emanuel Steward go in order to get back with Scully to help get ready for Dawson’s big fight this Saturday night against WBC light heavyweight champion Bernard Hopkins. This isn’t good news for Hopkins, because he’s not gotten better and seems to be just in the maintenance stage in his career where he’s trying to stay where he’s at. Getting better at 46 is pretty much impossible for Hopkins. The best that he can hope for is to try and slow down the deterioration so that he doesn’t slip too much. Dawson is going to be big problems for Hopkins if he’s able to throw a lot of punches and stay constantly busy like he’s been saying he’ll do. Dawson says that Scully isn’t an armchair trainer who just sits there and coaches from the sidelines. He gets involved, doesn’t allow Dawson to take a lot of rest breaks and immediately tells him when he’s doing something wrong. Dawson likes it this way and seems to have really jelled with Scully. He’s working hard and looking really good. If he can stay active in this fight for three minutes of every round, then Hopkins has no chance of winning because he doesn’t appear capable of throwing punches for three minutes of every round. We just haven’t seen seeing that from Hopkins.